Being able to quantify the benefits of change is integral to committing to that change. Changes likely to be implemented will range from simple modifications to an existing enterprise (for instance, a change in ram source) to complex changes affecting the whole enterprise (for instance, moving the focus from wool production to lamb production). It is not uncommon for potential returns from on-farm investment to vary from 10% to more than 30%, so it is worth identifying the better investments. Net change in expenses — taking account of any increased costs (cash and non-cash costs such as additional owner- labour requirements or depreciation on plant and equipment) and reduced costs. Net change in income — accounting for increased income and any trade-offs, such as lower wool income if there is an increased focus on lamb production. Scale of the investment — for example, an investment in pasture improvement will need to be accompanied by an often greater investment in additional livestock and may require increased management inputs. Likely repayment period — for the investment and the cash flow implications, taking account of the climatic and production risks involved. Life span of the expected benefits from the investment — for example, an investment of $50,000 in a change that produces a benefit of $15,000 p.a. over 10 years ($150,000 in total) is better than an investment of the same amount with the same benefit but only for 5 years ($75,000 in total). Nature of, and additional exposure to risk associated with any new or alternative enterprise. 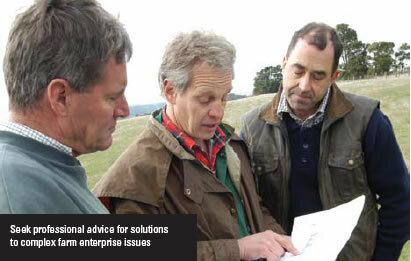 Farm businesses most often involve multiple enterprises with complex interactions between them. To ensure that returns are improved over the whole farm, the calculations are best done on a whole-farm basis. Two planning tools are provided in this procedure. The partial budgeting (tool 1.11) is most suited to significant investment decisions (buying more land, embarking on a new enterprise, re-fencing the farm, or embarking on a major revegetation program) where a more rigorous planning process is required. It is often demanded if significant borrowings are needed. Such significant decisions do not happen often on most properties. There may be only one or a few per decade. Tool 1.11 shows a worked example of a partial budget and the subsequent return on investment calculation. This can be used as a template for analysing straightforward adjustments to the business. Additional references are listed in the signposts. If the partial budget in tool 1.11 is not appropriate to the situation, or to the level of information or skills at your disposal, the SGS one-page planner (tool 1.12) might be more suitable. It is a less formal tool that allows quantitative and qualitative information to be included. This tool is most suited to important decisions that affect the operation of the farm – you might make several of these a year. The focus is on decisions that can have flow-on effects across the system, or decisions in areas where you lack confidence to do something ‘off the top of your head’. Examples of such decisions might include, for example, fertiliser applications, changing grazing strategies, selecting different rams, re-sowing a pasture, etc. Tool 1.12 provides a planning template and a worked example (assessing a decision to renovate a pasture) and provides the opportunity to incorporate non-financial information (such as environmental impacts). The tool can also be used to assess environmental projects that may have little financial analysis. Relative return on capital invested. The Farming Game – Agriculture Management and Marketing, 2nd Edition (2005) Bill Malcolm, Jake Makeham and Vic Wright, Cambridge University Press – to help determine comparative return on investments. Find private training and agricultural service providers across Australia who deliver training courses and offer advice on the incorporation of new technologies or new enterprises into farming businesses. Agricultural Consultants (outside WA) – go to the Ag Institute Australia website at www.aginstitute.com.au and click on the consultants register tab. Australian Association of Agricultural Consultants (AAAC) WA – www.aaacwa.com.au. Search this site for consultants and advisors in WA.